When you use display shelving, you not only save money on purchasing costs, but you also merchandise with much greater efficiency. You can showcase your most important products in key points of emphasis, and you can place more products per shelf to push larger amounts of inventory out of your showroom. We recommend you buy with a plan rather than simply looking for the cheapest price online. Strategically investing in the right used display shelves can further increase your profit margins by making more efficient use of your floor space and vertical cube space. You may have recently lost business to larger stores with higher square footage, but you can begin reclaiming this lost revenue now simply by creating the appearance of a larger facility. Customers will feel more comfortable in your store and take the time to look at the many specials and discounts you have to offer them. The key is knowing what types of display shelves to use and where to arrange them. There are basically only two categories of display shelving: double-sided, or aisle shelving and single-sided wall shelving, also known as wall shelving. 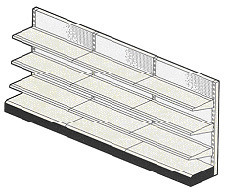 Aisle shelving supports a great deal of stock and also creates lays out aisle-by-aisle organizational patterns. It is an ideal investment for grocery stores of any size. Wall shelves provide smaller stores such as local hardware stores, pawn shops, convenience stores, and record stores with vital space conversion that transforms otherwise unused walls into important merchandising areas. It is rare, however, for a store of any type to rely on only one type of shelving. In almost every case, a combination of the two proves the key to effective merchandising and making the most of the room that is available. What is important here is how you ultimately arrange used display shelving of different heights and depths so as to create the most effective and efficient merchandising space possible. The depth of an individual shelf can be as little as 12” or as much as 22”. Knowing what size to buy and how much to buy depends upon the size of your store, your particular specialty, and the inventory you are promoting. 1. What is your total floor space? 2. How much of that space is not being utilized? 3. What is the square footage of wall space that is currently empty? 4. What are the space requirements for customer mobility between aisles, near end-caps, and near walls? 5. Where are the cash registers in relation to your merchandising areas (the display shelving you use must not be too tall in height. Visibility to some degree will be necessary for loss prevention). Customization transforms used display shelving into a powerful component of recession proofing any retail establishment in uncertain times. All we need to get you started in developing an entirely new merchandising plan is a set of photographs or blueprints of your current setup. From there we can pinpoint the best sizes, colors, and arrangements of used display shelves to install. Easy Rack carries a wide variety of shelves, dock loading equipment, commercial shelving, material handling equipment, used pallet racks, and modular buildings installed nationwide. If you can not find what you are looking for call us toll free at 1-888-776-3720 and we will find it for you. Our home office is located in Houston, Texas with regional distribution centers located in all 50 States including New York NY, Los Angeles CA, Miami, FL. Chicago, IL. Denver CO., Dallas TX, San Antonio, TX, Austin, TX, Boise ID, Atlanta GA, Albuquerque NM, Raleigh-Durham NC, Washington DC, Albuquerque NM, Huntsville AL, Fayetteville AR, Norfolk VA , Madison WI.